Chain piecing is a quiltmaking technique that lets you sew patchwork on an assembly line, greatly speeding up construction. To chain piece, we align the patches of fabric that need to be sewn and feed them through the sewing machine one after the other without stopping and without breaking the threads between the aligned patches. After cutting the quilt patches, align them right sides together to prep them for sewing. Pin the pieces together if necessary. Another option for simple patchwork is to help the fabrics stick together by placing a medium-hot iron on top of each pair. Stack the paired units within easy reach, next to your sewing machine. Start sewing the pairs together, feeding them through the sewing machine one after another, but without breaking the threads after stitching each pair. When units are all sewn, cut the threads between them and move on to the next step in the quilt pattern. Chain piecing isn't just for individual pieces of patchwork. You can chain piece the components of rows of blocks together, and then chain piece the rows to make a block. Use chain piecing for any task that will help speed up assembly. Some quilters like to begin each chain piecing seam by leading off with a scrap piece of fabric. That method is especially helpful when you sew matched triangles with pointed ends that sometimes tend to become pushed into the sewing machine's feed dogs. You can end a row of chain stitching with a scrap, too. What Are the Benefits of Chain Piecing? Chain piecing helps you sew patches, quilt blocks, or any other components of a quilt in a shorter time than it takes to assemble the same pieces one by one. Chain piecing makes it easier to press seam allowances, too, since all like units can be placed on the ironing board and worked on at the same time. The technique makes it more likely that you'll press to set seams—a method that instantly improved accuracy (but can be kind of a pain when you must get up to handle it after every single seam). 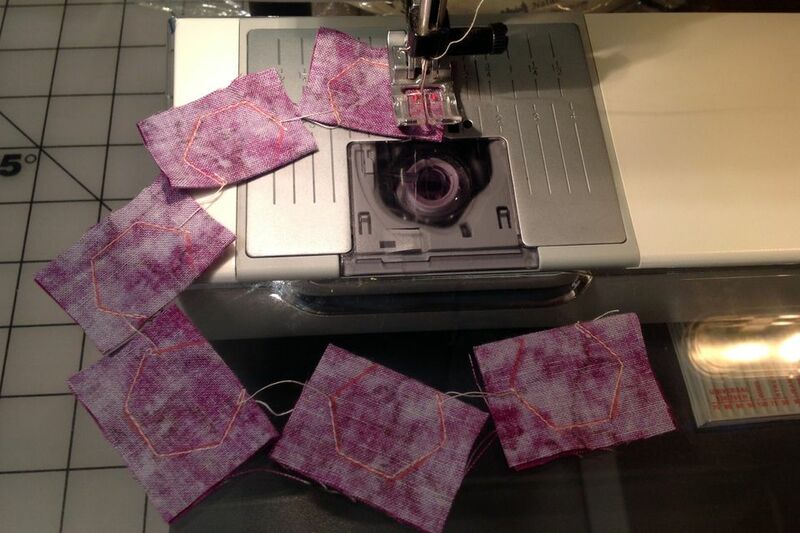 The photo illustrates chain pieced hexagons for Natalie Patton's Floral Hexagon Tape Measure Cover. Remember that it's always good to cut just enough pieces for a sample block or two before cutting all patches for any portion of a quilt. Don't sew an entire batch of patchwork before testing a few samples. It's important to catch seam allowance and cutting errors so that it isn't necessary to grab your seam ripper later. Are you working with a complicated layout? Chain piece in groups and return pieces to your design wall or another flat surface before sewing more seams.